Many of the existing carnitas recipes I ran across were crock-pot carnitas. I’ve made crock-pot carnitas before, and they were fine, but for this recipe I decided to use my Dutch oven. It’s a lovely 8 qt. Martha Stewart in bright orange that coordinates nicely with my vintage LeCreuset stuff, and I use it a ton. Adjust your oven rack to lower position and preheat oven to 300F. All your ingredients will go into the Dutch oven. I like to leave any fat on the roast & trim it off after cooking to add moisture and flavor. Even the orange peels will cook with the roast & impart their citrus notes. Pour the mead over top of all the ingredients. On the stovetop, bring Dutch oven to a simmer over medium-high heat, uncovered. Once a simmer is reached, cover the pot & transfer it to the oven. Cook for about 2-3 hours until the meat is falling apart. Allow to cool several hours, or ideally, overnight. Once cooled, you can remove the meat from the pot and begin to separate it, removing the fat & any bones or connective tissue (a shoulder will have 1 small bone). I like to do this with my hands, so I can feel the fat, meat, connective tissue etc easily. While you are separating the meat, remove the onions, and orange halves from the pot, leaving only cooking liquid behind. Reduce this liquid over high heat until thick and syrupy. It will take about 20 mins for the liquid to reduce. Tear the meat into bite-size pieces (think pulled pork) and spread evenly on a baking sheet covered with foil. Pour 4-5 ladles of reduced cooking liquid over the meat. Bake in a 300F oven for about 15 mins or until browned and a little crispy on the edges. Move meat around and flip during cooking as needed, usually every 3-5 mins. Serve on warm corn tortillas, with desired accoutrements such as avocado, tomatoes, lettuce, and onions. For a few weeks now I’ve had a play-date planned with my friend & co-worker. We work together for a small company, so if we want to go somewhere together a little planning is in order. 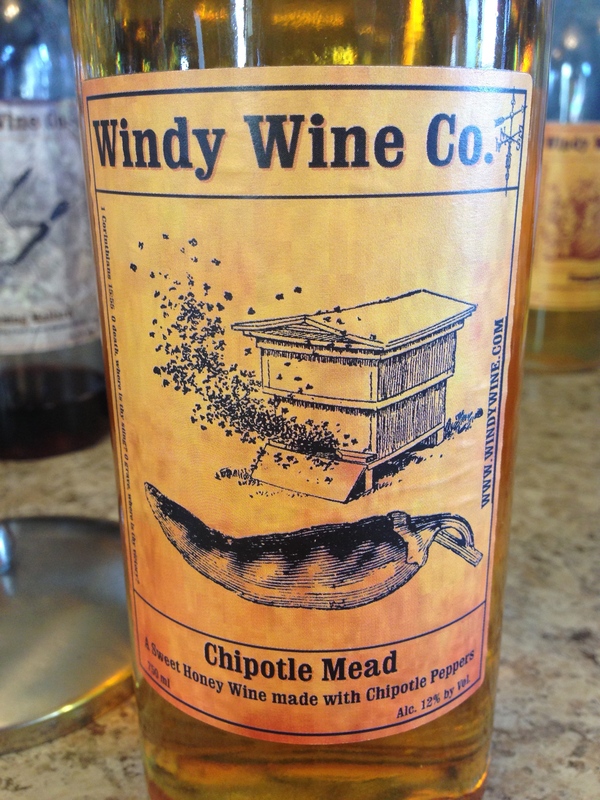 Back in August, I went & checked out Windy Wine Co. It’s a cool little spot about an hour away where they’re making some very cool, outside-the-box wines and meads. Recently, I was able to hit it up again; the line-up has changed & evolved seasonally (which is often apt to happen with smaller wineries) & I was able to taste some of the same wines I tasted last time, and I few new (to me) ones. On my last visit, I met Kraig, the vintner, very briefly. This time he did our tasting & we were able to talk about wine-drinking, wine-making, wine fests, mutual friends and acquaintances, and Dr Who. 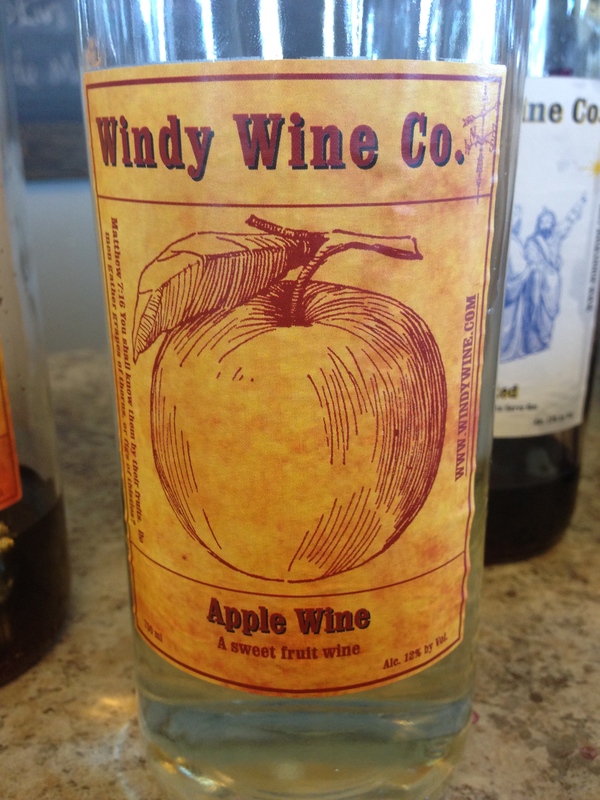 Windy’s Apple Wine had a lovely clean, slightly tart flavor with just enough sweetness. It’s made with locally grown Gala & Jonathan apples (my 2 faves), and has some very subtle woodiness. Reminded me of sitting in a tree on an Autumn day eating apples straight off the branch. 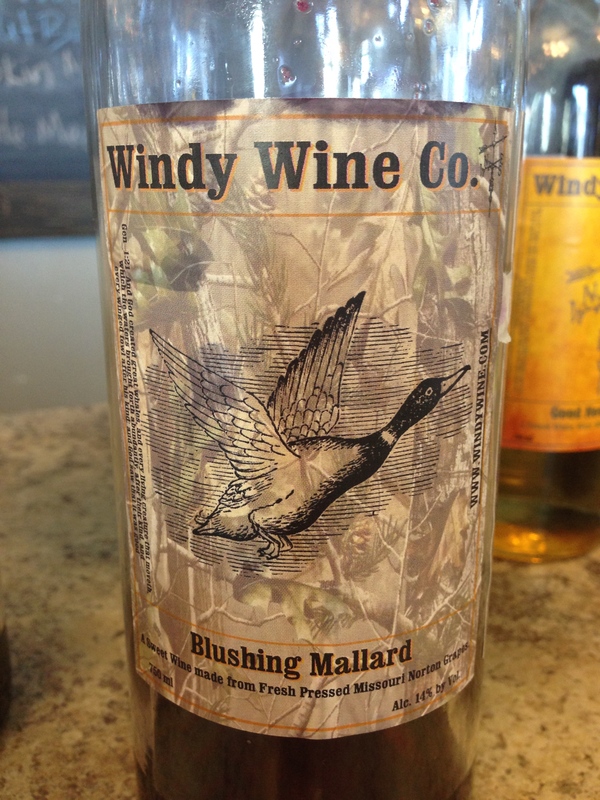 Blushing Mallard was another outside-the-box offering from Kraig. It’s made from local Norton grapes, which are not typically my favorite. I shouldn’t say this too loudly while in Missouri, since Norton is their state grape and has something of a cult following. However, instead of the typical spiciness and heavy tannins you usually find in a Norton, it’s much fruitier with an “untamed” wild cherry note (see what I did there?) starting in the middle and going all the way until the end. They recommend it with wild duck, but it would stand up beside any wild game. Very tasty. This guy was my winner of the day, surprisingly. I am not a huge mead drinker, I don’t go out in search of mead, although I know that plenty of folks do. This one is pretty unique, there are 3 layers of flavor here. At the back you have an earthy note, from the honey, then the expected sweetness and thickness coating your mouth & tongue, then on the end the deep, spicy chipotle. I definitely bought this with the intention of cooking with it, but I’m still trying to decide whether I want to slow-cook some chicken or pork, or maybe make some jelly. Or both. That will be coming up soon, so stay tuned. After we got done at Windy, we ended up stumbling onto a nice little Greek joint I found on UrbanSpoon, Gyro Paradise in St Joseph, MO (the birthplace of Eminem incidentally). We had some yummy lamb gyros, stuffed grape leaves, and falafel. The nice young guy at the counter even let us taste the baba ganoush and a few other items. Prices were great, staff was great, food was tasty. Will definitely be back the next time I’m in the neighborhood. It’s a little hard to schedule my wino/foodie field trips in my line of work, but I already have a few ideas for my next one, so this will definitely not be my last. Soon after I completed my last Wino Field Trip post the opportunity for another one came up. A friend, and fellow professional wino mentioned an event at the winery she pours at: Weston Wine Company. I’m always game for 1) trying new wines and 2) checking out interesting events that will let me try new wines so I headed over to check it out once I finished pouring for the day. This event is the first in a series of quarterly “book club” events. When we arrived we each received a packet with book notes, a listing of the Sideways inspired foods being served, and tasting notes on the five Sideways connected wines we would be tasting as well as an order sheet (should we want to take home any of the wines) and a coupon for a free glass of wine.Then we were pointed in the direction of a table of Sideways inspired grub: Tri-Tip, Pinto Beans, Garlic Bread, and Strawberries (with angel food cake!) Once we filled our plates, it was onto the wines! This was the first stop on our Sideways tour. 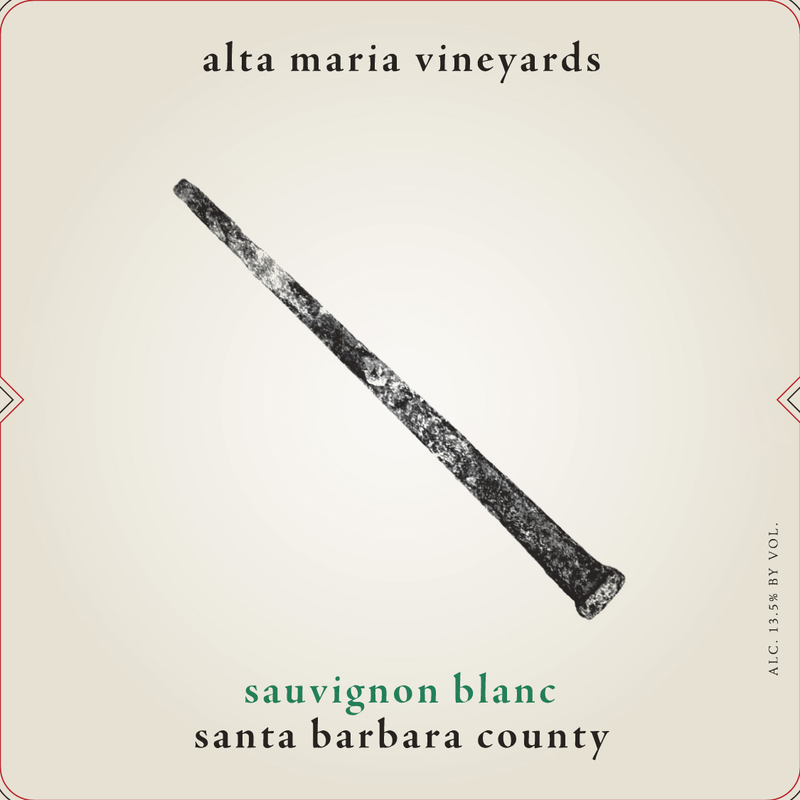 Alta Maria’s tasting room is located right next door to the Los Olivos Cafe where the quartet dine in the movie. This vineyard also has a personal connection for Weston Wine Company owner Colleen Gerke, a California girl, as she attended high school with the viticulturist. The only white wine of the night, this was a soft, tropical, Sauvignon Blanc with notes of honeydew melon at the start with subtle citrus rind behind and ending with slight mineral tones. It was especially tasty with the strawberries. Next, was the first of two (of course) Pinot Noirs. In Sideways, Jack is drinking a Byron in the car on the way to wine country. The movie Byron is a bubbly that is no longer produced, but since this is Sideways, a Pinot Noir is an acceptable substitute. 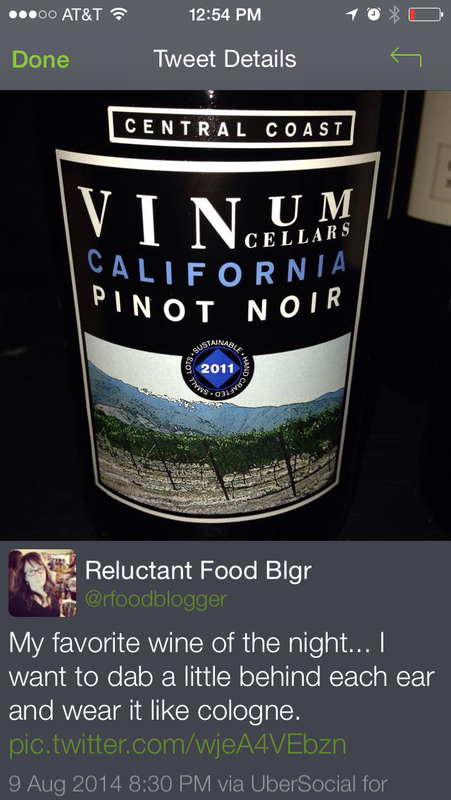 It was a fairly typical Pinot Noir, with red fruit notes, some slight spice, and smokiness. Pleasant between bites of tri-tip. Here’s my actual tweet about this wine. 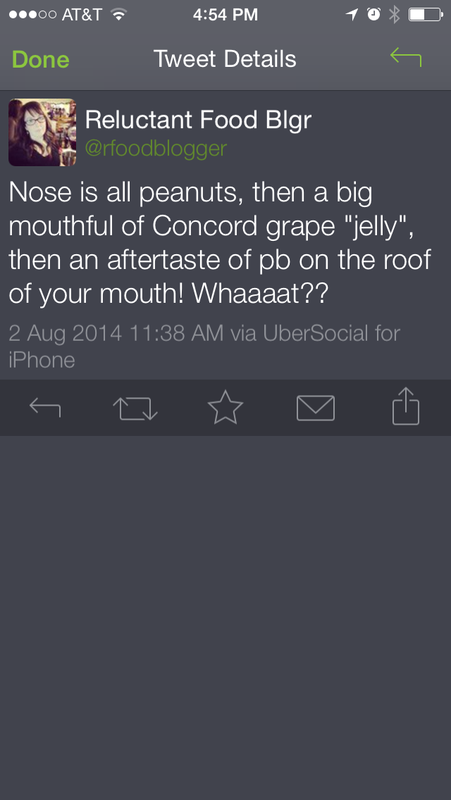 I actually wrote the words “wear like cologne” in my tasting notes. Juicy, ripe cherry, on a backdrop of earthy vanilla. Layered and complicated. Just like me. 🙂 Funny Sideways tie-in too: apparently these grapes are grown near where Miles throws a fit and gets out of the car in the film. So Fess Parker (AKA Fass Canyon) is where the infamous dump-bucket-drinking scene (AKA the bane of my existence) takes place. Fess Parker was the actor who played Davy Crockett and Daniel Boone in the 50’s and 60’s and this is his winery. We sampled the Frontier Red which is a blend including Syrah, Mouvedre and others. 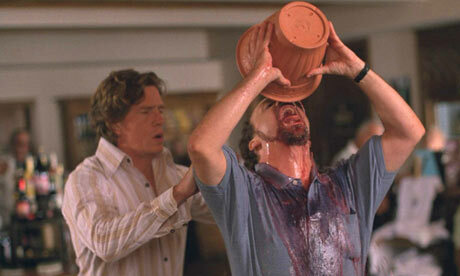 In the film, Miles is not a fan of this wine, which had a nice flavor of caramelized fruit, but heavy-handed oak. 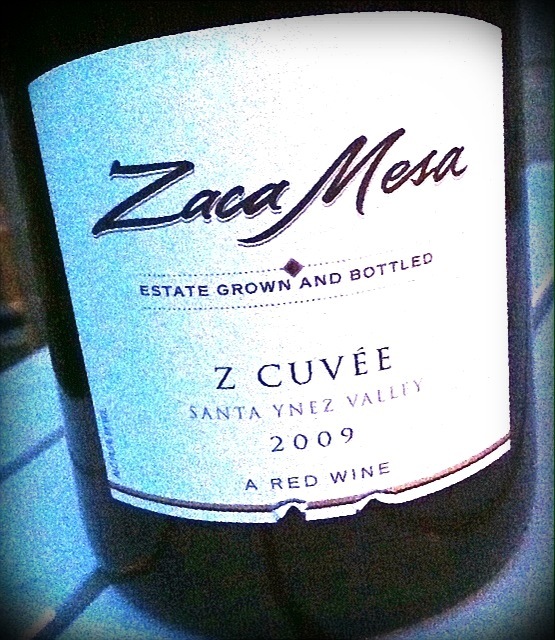 Zaca Mesa is up the street from Fess Parker (of wine-bucket-drinking fame) and the Z Cuvée is a Syrah, Grenache, Mouvedre blend and an old favorite of WWC owners Jason & Colleen Gerke. Inspired by the wines of Côtes du Rhône, this wine had aromas of plum, unique spice notes reminiscent of gingerbread, and a toasty oak finish. Despite the fact that there was “no effing Merlot“– (I don’t care what Miles says, I like Merlot) I’m glad that I checked out this event, and double-glad that no one thought it would be funny to drink the dump bucket. I’ve got What to Drink With What You Eat all loaded in my Nook (it was already on my Goodreads list) to prep for the next “Book Club” night on 10/25. Wino Field Trip: Windy Wine Co. I had heard about this winery several years ago, but while I was checking out the list of 2014 Missouri Governor’s Cup winners something jumped out at me and I knew I would have to make the trip (just about an hour from my home) and check out what these guys were doing for myself. What was the gamechanger? 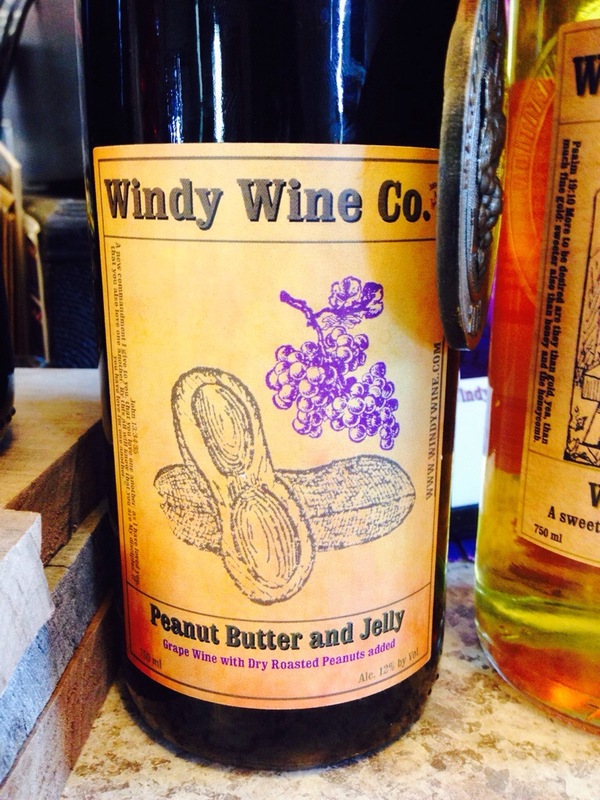 Peanut Butter and Jelly Wine. It brought home the GOLD. I needed to go and experience this wine for myself. We were doorbusters, as in we arrived just as they were opening at 11AM. The tasting room is where their vines are, so it’s kind of remote but lovely. I had my game face on and was ready to taste some wines! 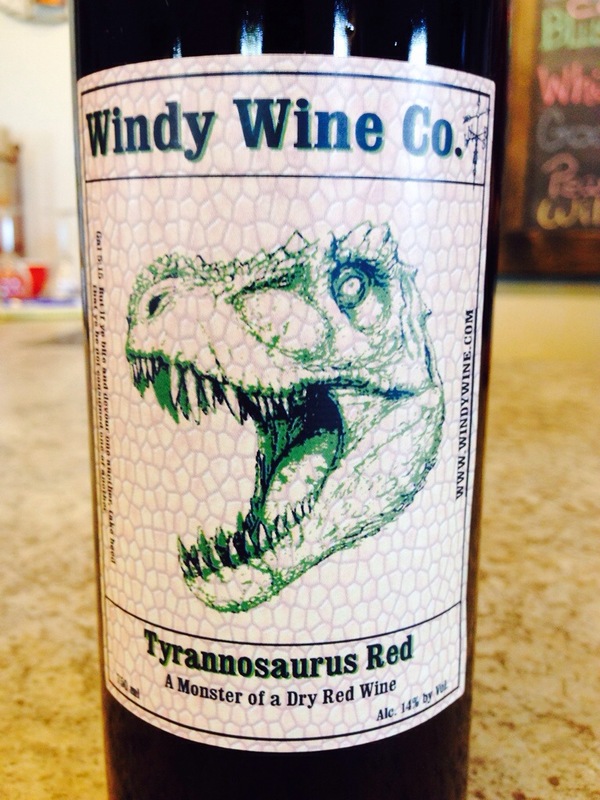 Tyrannosaurus Red: This wine has a lot going on. That’s actually what I said when I took my first sip. It’s a blend of Norton (the Missouri state grape and not usually my favorite) and Chambourcin (another locally-grown grape with a delicious earthiness to it). T-red is aged in American, French, and bourbon barrel oak. According to Kraig, the vintner, the bourbon barrel imparts flavors of “rich vanilla and smooth toasted spices”. What I really enjoyed about the T-red was its complexity- layer upon layer of flavors. An undertone of soft earthiness, then vanilla, spice box, black pepper, and cherry notes each take their turn on your palate. A bottle of this one followed me home! 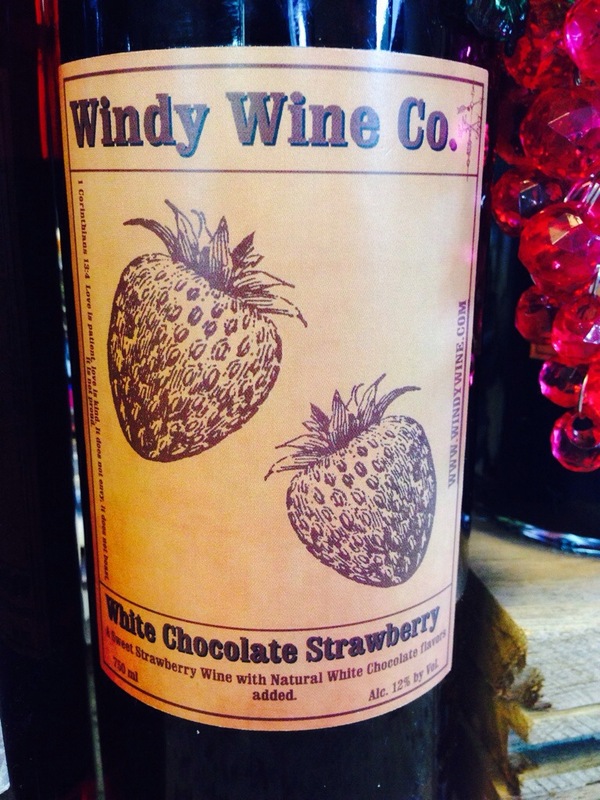 White Chocolate Strawberry: This wine had me skeptical. First of all, I detest white chocolate. Really, it’s not even chocolate at all. According to the FDA a chocolate should contain cocoa solids as well as cocoa butter. Also, in the realm of all berries, strawberries are probably my least favorite. Strawberries aren’t actually berries either, but that’s another blog post. I was fully prepared to have my friend, who likes both of these things, evaluate this wine more fairly than I could. Boy, did this wine prove me wrong. The strawberry wine was just sweet enough, and just tart enough. Like eating an actual strawberry. The white chocolate was more of a mouthfeel than a flavor. A slight sweetness, behind the strawberry and a softness in your mouth at the end. A very nice surprise. Peanut Butter and Jelly brought home a Gold Medal at the Missouri Governor’s Cup! We were also fortunate enough to try a sample of the Mango Mead that wasn’t even bottled yet (nice and summery) and it was super-nice of them let us test-run a Mediterranean platter of pita, crackers, hummus, veggies, and feta. The munchies they hooked us up with! 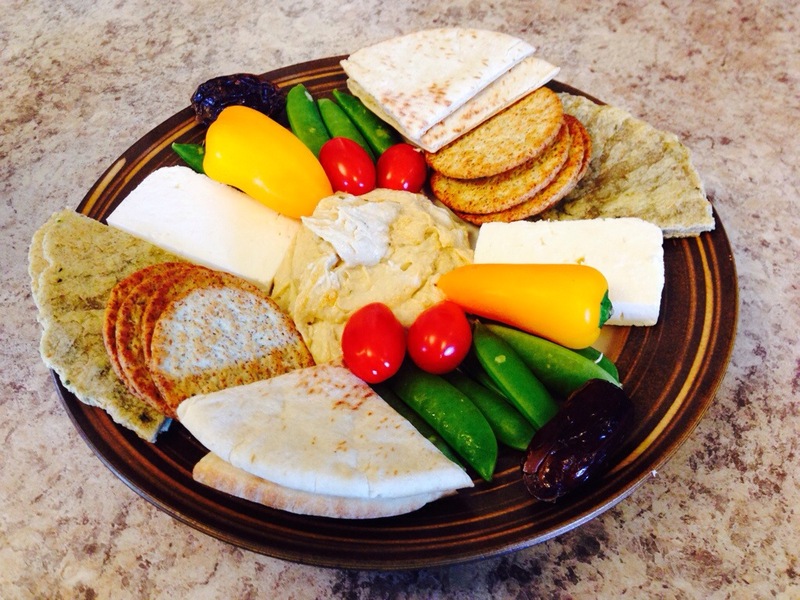 You had me at hummus…. We are already planning our return trip to try out some of the fall wines such as Campfire Mead (I’m told it tastes like toasted marshmallow!) and to let our men try some of the beers they have available brewed by Black Belt Brewing Co. I’m not a beer gal, mind you, but I really liked the Ninja Breakfast, a milk stout that had a gentle flavor and was not overly heavy. Thank you for your hospitality Windy Wine Co –you’ll be seeing me again soon!